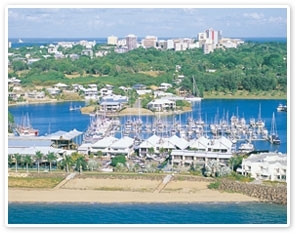 Sit back and relax as your Driver Guide takes you through the beautiful city of Darwin. You’ll get the perfect introduction to Darwin’s history and landscape with visits to the Chinese Temple and a stroll through the Botanic Gardens. Enjoy a tour of the historic sites of the city including the East Point Military Precinct, Mooring Basin and the Stokes Hill Wharf area. You’ll gain insights into Australia’s WWII history and the bombing of Darwin. There is also time to explore the Museum and Art Gallery of the Northern Territory which showcases collections encompassing Aboriginal art and Northern Territory history. This is the main museum in the Northern Territory and the region’s premier cultural institution. Take an optional Sunset Dreaming cruise and be welcomed by a Traditional Owner of Darwin Harbour for an interactive cultural experience. Learn to throw a spear and create traditional Aboriginal crafts, then sit back and relax as you absorb the exquisite sunset.